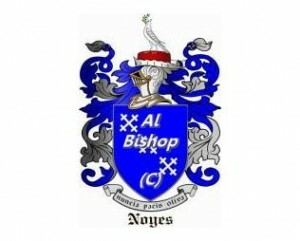 The surname NOYES is rare. It may have originated in East Anglia at a very early period. Land held by Walter Noyse was mentioned in a fine concerning land in ‘Scroteby’, Norfolk, on 10 May 1209. William and Simon Noysse were both listed in the Ville of Laxfield, in Hoxne Hundred, Suffolk, in 1327. There were six Noyse wills proved in the Court of Archdeacon of Suffolk before 1600: Robert Noyse, of Fressingfield, 1463; Agnes his widow, of Fressingfield, 1464; William, of Ubbeston, 1469; Robert, of Wingfield, 1471; William, of Laxfield, 1510; and Robert, of Laxfield, 1510. The adjoining parishes of Laxfield, Fressingfield, Wingfield, and Ubbeston lie in the north-central part of the county. The chief landholder in the region then was the de la Pole family, first Earls, then Dukes of Suffolk. The land came into their family through the marriage of Katherine, heiress of Sir John de Wingfield, to Michael de la Pole, first Earl of Suffolk. The manor of Ramridge, Hampshire, had also been acquired through the Wingfield marriage. For this reason it is possible that the Duke sent one of his Suffolk men to oversee the distant Hampshire manor, founding the Noyes family in that county. Ramridge was important as one of the greatest fairs in England was held partly on its lands. Ramridge was held by the first Earl of Suffolk at his death in 1391. The Wingfield estates passed to his eldest son, Michael, who succeeded as Second Earl (d. Sept. 1415), but, importantly, Ramridge was settled on the male heirs of his younger brother, Sir Thomas de la Pole. On Thomas’s death (21 Aug. 1420), it passed to his son Thomas, who died seised of ‘Ramrugge’ on 27 July 1430. Because he died without male issue, Ramridge passed to his cousin, William de la Pole (son of the Second Earl), who was created first Duke of Suffolk. Thus Ramridge was reunited with the Wingate estates in 1430. The first of the Noyes family in Hampshire may have arrived as servants of the first Duke of Suffolk at his manor of Ramridge about 1430-32. The court rolls of the manor of Ramridge record that Robert Noys was farming the manor (rendering its accounts) in 1432-33. The Duke and his wife, Alice Chaucer, granddaughter and heir of the poet, were granted license to found God’s House, better known as Ewelme Hospital, in 1437, but it was not endowed with the manor of Ramridge until 1442. It was during this short period between 1430 and 1442 that a Noyse/Noyes from Laxfield or Wingate, Suffolk, might have ended up on the distant manor of Ramridge, as the Hospital would have had no Suffolk interests by which to draw a Noyes from that county to Hampshire. The Noyes family continued as farmers of the manor of Ramridge for at least two more centuries. The court rolls are intermittent, so the line of descent in the earliest generations in Hampshire is not clear. Robert Noys is recorded as rendering accounts for the manor of Ramridge in 1432-33. John Noyse was the farmer of Ramrugge on 26 November 1476, 28 November 1477, 1478, 1482/3, and 1484. He likely died in the next few years, as Robert Noyes was farmer of Ramrugge in 1493 and 1497. The abstract under date 21 May 1 Henry VIII  states, “To this court came Thomas Noyse and took of the lord a cottage called the Saynte with lands and one acre of meadow … to hold to the said Thomas and Agnes his wife and the longer liver of them – to pay heriot on death. And give as fine 20s. Same paid 19 Henry VIII (1503/4) [sic].” The entry for 27 September 4 Henry VIII  reads, “presented that Thomas No[y]se farmer of this lordship and his predecessors, time out of mind, had amongst other things a parcel of land called the “Stallys” and “Bothis” lying on the King’s way leading E&W as appears by metes and bounds.” On 16 September 9 Henry VIII  the Master of Ewelme granted Thomas Noyse the lease of the capital messuage of his manor of Ramrugge with the lands thereto belonging, courts, etc., excepting the advowson of Wee [Weyhill] Church, for a period of 50 years at a rent of £8 6s 8d. Another lease, dated 21 June 10 Henry VIII  granted the same, at the same rate, for a period of 40 years. Thomas Noyse was farmer of the manor on 6 October 20 Henry VIII  when he made agreements with his tenants This last Thomas Noyes is certainly Thomas Noyes (b. say 1488), from whom descent can be traced with certainty. There are two likely scenarios by which Ramridge might have descended through the earliest generations of the Hampshire Noyes family. The first scenario assumes a direct descent through  Robert (b. say 1390), [II] John (b. say 1415), [III] Robert (b. say 1440), [IV] Thomas of Andover (b. say 1465), to [V] Thomas (b. say 1488). The second scenario takes into account the possibility that the Robert who farmed Ramridge from 1493 to 1497 might have been Thomas’s uncle Robert, who later acquired the lease of the manor of Littleton, and may have held Ramridge during the minority of his nephew Thomas as guardian. The earliest [I] Robert (b. say 1390) who farmed Ramridge in 1432-33 would again be the first generation, then the second generation would be unknown. [III] John (b. say 1440) who farmed Ramridge from 1475 to 1484 would be next, and father of both [IV] Thomas (b. say 1465) mentioned in the court rolls of Andover 1490-1491, and Robert, of Kimpton, who farmed Ramridge from 1493 to 1497 during the minority of his nephew, [V] Thomas Noyes (b. say 1488). But as only names and dates have been gleaned from the manorial records, no specific relationships are known with certainty until we reach Thomas Noyes (b. say 1488). It is impossible at this point to determine which descent is correct. [Excerpted from “The English Ancestry of Peter Noyes” by Paul C. Reed and Dean Crawford Smith, NEHGR 152:259, July 1998].From this family descended Nicholas, son of Robert and Joan (Mondey) Noyes, who was on a 1545 list of taxpayers for the benevolence of Cholderton in the county of Wilts. This Nicholas had a son, Robert, who was the father of William, rector of the church at Cholderton in 1601. Two of William and Ann (Parker) Noyes’ sons, James and Nicholas were the immigrant ancestors in 1634 of nearly all families with the Noyes surname existing today in the United States. The other Noyes immigrant at this time was Peter who arrived in New England in 1638 and settled in Sudbury. The line of Peter Noyes ended when there were no sons born to the third generation. Until only recently, Peter was suspected to have been a cousin of James and Nicholas. That relationship has now been proven. The line of Noyes in my family daugther-ed out with Carl and Gladys Noyes with 5 girls the last remaining daughter is Lois Gulina and seventeen nieces and nephews and several grand-nieces and nephews. I remember one picnic in 1964 when my father bought a brand new Ford Custom white/red interior and we drove cross country to see our oldest sister/daughter. Wow…I knew Noyes was rare cause I always looked in phone books and saw very few listed under that name. Funny I am a female veteran too and see this is prevalent in Noyes history. I plan on joining Ancestry.com! My family is located in Vermont!